(Bloomberg) -- Big companies often leave their suppliers hanging for weeks without pay, but Vodafone Group Plc is taking this a step further: it’s investing in a fund that makes money off the delay. The British phone operator poured 1 billion euros ($1.1 billion) into the 2.4 billion-euro fund run by beleaguered Swiss asset manager GAM Holding AG, which generates returns by paying suppliers early if they accept less than they’re owed. The fund is full of invoices from many of Vodafone’s 15,000 vendors of anything from antenna systems to furniture, according to three people with knowledge of the investment, who declined to be identified because the data are private. Vodafone makes its partners wait 48 days for their money, versus a 36-day global average, according to consultancy PricewaterhouseCoopers. While companies postpone payments all the time to keep cash on their balance sheets and bolster a metric known as working capital, earning investment income from the haircuts their suppliers bear if they can’t afford to wait is unusual, according to Daniel Windaus, a partner for PWC’s consultancy arm. Vodafone began building a position in the GAM-Greensill Supply Chain Fund, jointly run by GAM and London-based Greensill Capital, in 2016 and its holdings have since grown five-fold, the people said. A footnote to its full-year 2018 financial statements revealed a big annual increase in short-term investments related to "supply chain and handset receivables," but no details were disclosed on what those investments were. A Vodafone spokesman wouldn’t say how much of the 685 million euros of investment income earned in the 2017-2018 fiscal year came from GAM. The company said it invests in a range of low-risk instruments including gold-backed bank deposits and bespoke investment funds. Vodafone noted that in the case of the smallest U.K. suppliers, it pays within 30 days. The GAM fund used to be run by Tim Haywood, the money manager who was suspended last July over allegations of misconduct and later fired, a decision he is appealing. A GAM spokesman declined to comment. Greensill called supply-chain finance a “win-win for suppliers and their clients alike” and said it offers rates below those available elsewhere, on average less than 100 basis points over Libor. “Early payment improves a supplier’s cash-flow position without any impact on their client’s finances,” said Lex Greensill, the firm’s founder and CEO. 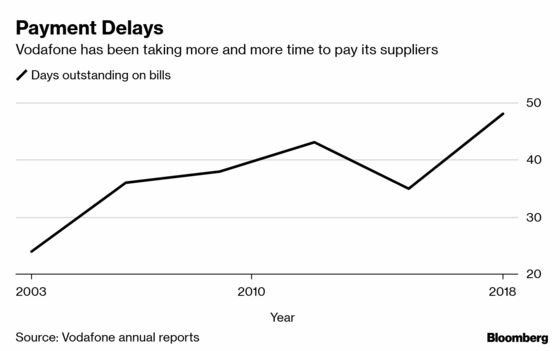 Vodafone’s payment delays are part of a broader trend in "supply-chain bullying" that leaves suppliers stranded without cash, according to Lorence Nye, a policy advisor at the Federation of Small Businesses, which represents 170,000 U.K. companies. By putting money in a fund which offers early payment to its suppliers rather than doing that directly, Vodafone can classify those payables as short-term investments so they don’t eat away at its cash balance, something that would in turn make its debt burden look worse. The phone operator has found other ways to try to protect its credit rating, which was downgraded by Moody’s Investors Service to two steps above junk last month. To finance its $22 billion takeover of Liberty Global Plc’s cable networks in Germany and eastern Europe, for instance, Vodafone this month sold 4 billion euros of mandatory convertible bonds that won’t be counted as debt on its balance sheet because they’ll eventually be switched into equity. This is an acceptable accounting practice in the industry. Even so, criticism has mounted that the biggest auditing firms are too lenient on their clients. The U.K. this month even abolished its accounting regulator, the Financial Reporting Council, to replace it with a body that will presumably be tougher. What that will mean for suppliers is unclear. Until a few years ago, banks handled most supply-chain financing for big corporate clients, paying larger vendors at a discount of a few percentage points to face value, called reverse factoring. But smaller businesses couldn’t access cash that way and would often need to resort to expensive borrowing, creating a gap that’s since been filled by funds like the one run by GAM and online platforms including Previse Ltd. and PrimeRevenue Inc. Investors can get up to 5 percent returns for invoices of investment-grade companies, and even higher if they are junk-rated. Vodafone’s investment, then, could be seen as a natural extension of the trend. That may not make it easier for suppliers to swallow, according to Dominic Capolongo, the global head of funding at Atlanta-based PrimeRevenue, whose clients include suppliers for firms like Keurig Dr Pepper Inc. and Volvo AB. “If you’re generating a profit and the supplier finds out about that, the supplier will say ‘why are you generating a profit off me?’ and it will diminish the relationship,” Capolongo said. More companies will probably follow in Vodafone’s footsteps if you ask Lionel Taylor, a former supply-chain finance banker at Lloyds Banking Group Plc who now runs a consultancy called Trade Advisory Network.